I write a decent amount of book reviews for my blog. Reviewing Buechner is different. How does one begin to review a master? 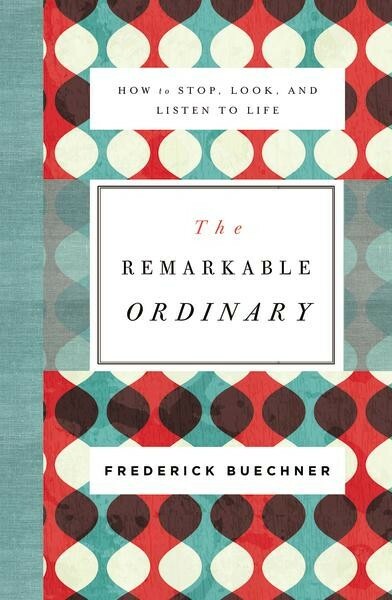 Still, I was given an advanced digital copy of his forthcoming book The Remarkable Ordinary from Netgalley so I need to keep up my end of the bargain and write something. I’m actually sitting on a plane right now somewhere between Houston and Salt Lake City. I just put down my Kindle (which I later realized I left on the plane) and I have to say that I had the same experience with this book that I’ve had with most of the books that I’ve read by Buechner. That is, I simultaneously smiled and had tears in my eyes. The other day I was listening to a conversation between Krista Tippett and the late John O’Donohue. It was a remarkable conversation. Towards the end of the conversation Tippett said something fascinating about Celtic music. She remarked that “it seems to express the greatest joy and also the deepest sorrow, almost indistinguishable from each other, and yet both with a kind of healing force.”⁠1 That’s a great description of Buechner’s writing! Great joy and great sorrow mingled together with healing in it. If you’re familiar with Buechner’s work you’ve probably heard him tell some of these stories before. There are several times throughout the book where he’ll basically say, I’ve written about this before but…here we go anyway. There’s a freshness their telling, though. This is not like reading the same story twice (though I suppose there can in many ways be a freshness to that in a different way). He tells his story in a new way, like the man nearing the end of his life. There is a hopeful rawness to it all. Abraham Heschel once said, “In our own lives the voice of God speaks slowly, a syllable at a time. Reaching the peak of years, dispelling some of our intimate illusions and learning how to spell the meaning of life-experiences backwards, some of us discover how the scattered syllables form a single phrase.”⁠2 You get the feeling in this book that Beuchner has found that phrase and is is spelling it out for us one beautiful letter at a time. He is also providing the hope that we, through our own journeys, will find our phrases too if we simply pay attention to the Remarkable Ordinary. I can’t recommend this small book strongly enough.